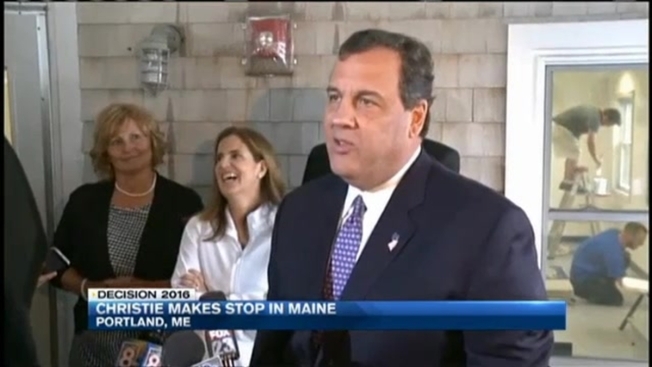 Christie Endorsed by Maine Gov. Just one day after announcing his campaign for president, New Jersey Governor Chris Christie made a stop in Maine to receive an endorsement from his friend and fellow Republican Governor Paul LePage. At Becky's Diner in Portland, Christie and LePage told reporters they are friends and share a similar leadership style. "He's been an inspiration," said LePage, calling Christie his mentor. He said he is endorsing in Christie because he is "the real deal." "Our particular style of leadership can give the country a rebirth," Christie said. LePage's endorsement is the first from a sitting Republican governor in the 2016 Presidential race. "To get an endorsement from Paul LePage is an incredible honor for me," said Christie, calling him a good friend and strong leader. The two governors said they have a similar leadership style, "tell it like it is" and put people over politics. "We need to wake up the American people," said LePage. The two also share a common experience of political controversy. Christie has weathered the "Bridgegate" scandal of 2013, when he was accused of closing a bridge and causing traffic problems for political retribution. LePage is also accused of exacting political revenge. Last week, Democrat Speaker of the House Mark Eves accused him of blackmail so his employer, the Good Will-Hinckley charter school, would fire him. LePage has admitted that he threatened to pull funding from the school if it did not remove Eves as president. Wednesday, a government oversight committee voted in favor of investigating the blackmail violations, possibly paving the way for impeachment. "I support the Governor's leadership," said Christie. "Controversies come and go, but leadership is what stands strong and firm." LePage has stated that he threatened the pull the funding because he was looking out for the best interest of the school. Christie said LePage will become a bigger part of his campaign, and will be invited to travel with him.